Dependent on tumor location: The child is positioned according to the site of the DNET. For temporal lobe tumors (the most frequently encountered), both a supine and a lateral position may be chosen, depending on surgeon’s preferences. Care must be taken not to overstretch the neck. Head fixation: The head is fixed in a Mayfield-type head holder. Appropriate pins and pressure must be used, depending on the patient’s age. In very young children and infants, headrests that do not require pins may be an option. As with other glioma surgeries: The surgical approach is analogous to that used for glioma surgery. 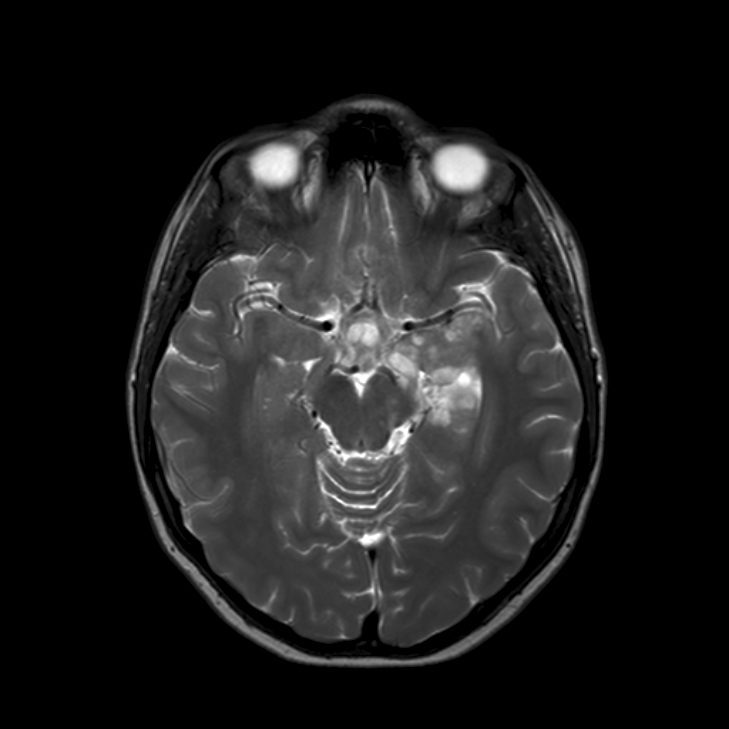 Frameless image-guided neuronavigation is of benefit in almost all cases. The extent of the bone flap can be modeled using the guidance view of the neuronavigation device to allow a good view with the microscope in all directions. As a general rule, DNETs within the temporal lobe are resected by temporal lobectomy (with or without hippocampectomy), whereas extratemporal DNETs are subjected to more restricted lesionectomy. Minimal retraction: After the dura is opened, the tumor can be reached transcortically or through a sulcus, depending on its location. Minimal retraction should be exerted on the surrounding brain to avoid contusions and gliotic scar that may cause later epilepsy. Ultrasonic aspirator: The resection of the DNET is usually performed using an ultrasonic aspiration device on a low- to moderate-intensity level. Sufficient samples are taken for histology. Image guidance: DTI can be useful in guiding resection. 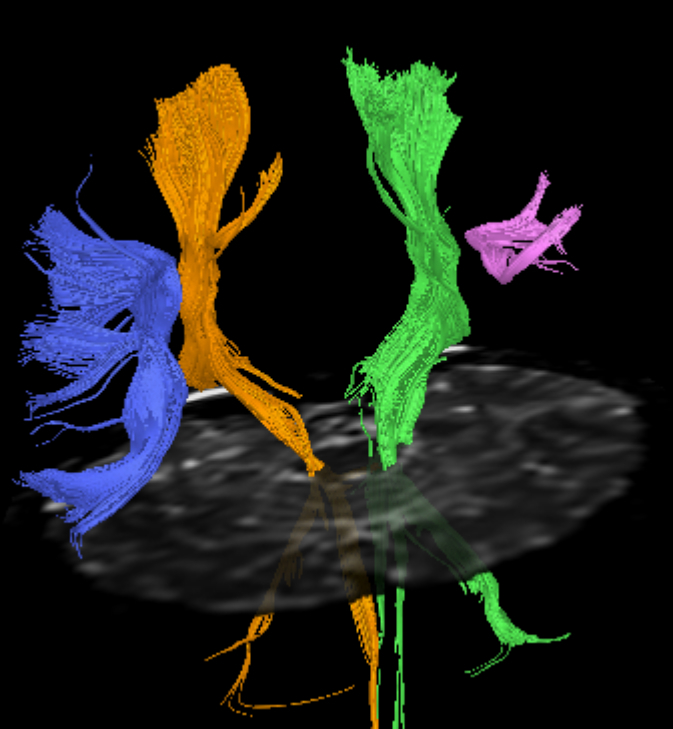 DTI of left temporal DNET shown to left: Functional tractography showing both corticospinal tracts (pink) and arcuate fascicles (blue). Resection to interface with normal brain: In most cases, there is a visible border (color, consistency) with the normal white and grey matter, and a complete resection of DNETs is achieved with more ease than resection of some poorly demarcated low-grade gliomas. Intraoperative ECOG: Intraoperative ECOG can be of value to resect not only the tumor but also epileptic foci in the vicinity (19). ECOG led to a more extensive resection in 10 of 17 cases reported by Sandberg et al. (36) and in 10 of 11 cases described by Spalice et al. (38). Intraoperative view after resection of right temporal DNET: The posterior part of the hippocampus has been spared. Hemostasis: Since most DNETs are not highly vascular, hemostasis is obtained with bipolar forceps, tamponade, and the restricted use of hemostatic agents such as oxydized cellulose, fibrin glue, and the like. Agents such as Floseal® hemostatic matrix, which are sometimes useful in other types of intracranial surgery, are rarely indicated. Dura: Careful, watertight closure of the dura should be performed as in any other intracranial procedure. Bone: The bone flap is replaced in the usual way using either small plates and screws, sutures, or clamps. In younger children it may be of benefit to use resorbable systems to avoid problems with the growing skull and avoid having to do a second surgical procedure to remove the titanium material.